This MAb reacts with a reduction-resistant epitope present in both free and SIgA bound Secretory Component. This MAb reacts with a reduction-resistant epitope present in both free and SIgA bound Secretory Component. It does not react with the cell lines lacking secretory component. 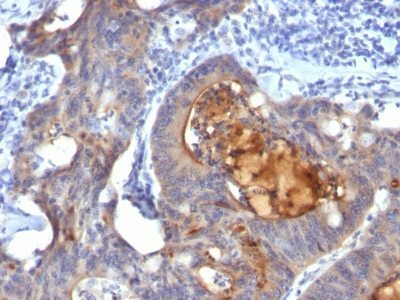 The antibody is useful for studying the distribution and level of both free and bound secretory component. Secretory component is differentially expressed in epithelium, and the antibody is a popular marker for identifying subpopulations of epithelial cells and epithelial differentiation. The Secretory component antibody is a useful research tool for studying mucosal immunity, inflammation, remodeling, differentiation and tumorigenesis, all processes associated with differential secretory component expression. Catalog number key for antibody number 0792, Anti-IgA Secretory Component (ECM1/792) The prefix indicates conjugation, followed by the antibody number and size suffix.